"If we can't get them out, we'll breed them out." When the king of Scotland dies, England's ignominious king, Edward the Longshanks (McGoohan), takes possession of the land North as his own. Cruel, oppressive and megalomaniacal, Longshanks treats his bounty with disdain. "The problem with Scotland is," Edward says, "that it is full of Scots!" In order to breed them out he invokes the ancient feudal custom of prima noctes, whereby the aristrocratic English owner of the land is allowed to take any Scottish bride, wed therein, into his bed on her wedding night. The main story told here is about how a common Scottish farmer, William Wallace (Gibson), who prefers to live in peace but instead, when his fiancée is killed by the English, leads a band of ragtag soldiers and Irish mercenaries against Longshanks and wins, if temporarily, Scotland's freedom from tyranny over 700 years ago. Unfortunately, little is known of the actual Wallace, and Randall Wallace's screenplay borrows heavily from Shakespeare's Henry V.
Edward Plagenet I marries off his son, Edward II (who happens to be homosexual), to his enemy's daughter, the princess of France, in hopes of a real heir. While Longshanks is away in France, the feeble son is unable to outwit Wallace and his guerrilla tactics. At the heart of the story is Wallace's relationship with Robert de Bruce, the Earl who would become king, who at first fought with Wallace at Stirling, then betrayed him at Falkirk, then fought in his name in his stead, wresting the throne of Scotland from Longshanks by force. 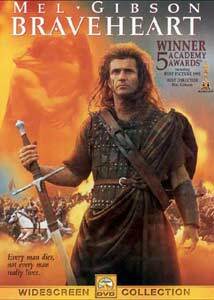 Braveheart is a beautiful, sweeping tale, brought to film by star Mel Gibson in his directorial debut. In case you missed it, the film and Gibson won 5 Oscars®, including Best Picture and Best Director. I happen to be a big fan of Gibson, more so for his smaller films than the blockbusters, particularly Hamlet and The Year of Living Dangerously, where his Shakespearean training and humor are best used. In fact, had the version not been so abridged, I would deem his Hamlet the closest I have ever seen to my own reading of the character. It is with one eye toward the raw power of this tale, the other toward the humor that makes Gibson's treatment so special. I have watched this 7 times now since receiving it, and I barely grow tired of it. Since so little is known of Wallace, in order to fill in the story much had to be gleaned and homogenized from what facts are known, and the history of the time. I have little problem with this (it should have been acknowledged up front), but what does bother me as an English Literature major in a past lifetime, and here my friend Shelly for once is absolutely right, is the substandard nature of the language. Screenwriter Randall Wallace admittedly wrote this as a modernization, but I think the dumbing down of the language reduces this from the elite rank (such as Henry V) to a fine film, and almost guilty pleasure. Don't get me wrong, I didn't watch this film 7 times just to gather ammunition for my B+ image transfer later on in this review, but because I enjoy it. Much like Brannagh's Henry V, Braveheart shows well the brutality of hand-to-hand combat in a way few other films have. If for nothing other than these credible battles of blood, dirt, axe, sword, arrows, horses, infantry, and the like, Braveheart is a wonder to behold. You will have to watch the excellent accompanying documentary to understand the preparations taken to secure these scenes, some of which were groundbreaking. Gibson purposefully chose to match the epic nature of Spartacus. The performances within are as powerful as the story. Catherine McCormack as Murron is alluring, but Patrick McGoohan (Longshanks) steals all of his scenes, if not the film. Image Transfer Review: I felt at first I was going out on a limb here in my update last week about my disappointment with this transfer, but I have scrutinized it 7 times on both 4:3 and 16:9 HD with a progressive scan player, and I remain disappointed. Still, this is a nice transfer, and most of the fault I think can be attributed to the source materials more so than the transfer, but ultimately it is Paramount that must carry the blame that a cleaner print was not used. On my 45" 4:3 Mitsubishi the transfer is sacked by scan lines, dirt , blur, edge enhancement and—at times—horrible amounts of aliasing or moiré. With help of a very nice gentleman at United Audio whose card I have temporarily misplaced, we fine tuned (several times) a 58" Pioneer Elite HDTV, connected via component cables to a Toshiba 9100 progressive scan player. While the calibration removed evidence of scan lines and edge enhancement, the aliasing and dirt remained (the opening and first battle scene are the worst), and it also made it more apparent that the contrast is wildly variant, to the point that one gets the feeling it varies dependent upon film stock used for shooting. We turned down the sharpness to lose the graininess, but had to adjust it back up to gain back some of the detail, such as facial hair and pores. The image goes from bright and brilliant to dark and greenish or sepia-toned and from blurry to very sharp. It is this inconsistency, along with the sorrowful amount of dirt and aliasing that causes me to drop the grade here to a B+. It just doesn't hold up to Fight Club or Fifth Element standards. If the goal is to be film-like it succeeds, but more in the vein of a second-run theater print. BUT—don't be afraid, it won't look any better I'm fairly sure until Paramount releases the HD-DVD - which might be a while. Don't let this dissuade you from purchasing this disc. Audio Transfer Review: The 5.1 track lacks much in the way of rear surround activity, but the front soundstage is very impressive. A sweeping effect of horses from left to right scared me even this 7th time watching, and I felt a hail of arrows raining down upon me so that I had to take cover with my laptop over my head. No, I didn't moon the TV when the barrage of arrows abated. The musical score is beautiful and haunting, and it is unfortunate the mix wasn't built deeper, with the entire room in mind. It is still a very nice mix. Extras Review: There are two trailers included, and English subtitles, which warms the cockles of my heart. I have twice sat through a listening of Mel's commentary, which is unfortunately slim and far between. I think this is a shame. This would have been better off with a second person or group of people, so that the lapses might be filled in with Mel's sparkling repartee for which he is known. Mel spent an awful long time on this film, so to have so little to say about it seems very strange. What he DOES say is interesting, especially when he hits stride after the first hour or so, around the first major battle scene. Mel is a funny and personable guy, and this track leaves one wishing for more of him. The documentary, A Filmmaker's Passion: The Making of Braveheart is excellent, with interesting and fun details and behind-the-scenes footage galore. You get everything from the assembly line costuming and mud fitting, to the attempts to make the clothes as accurate to the dyes and cloths of the time, to the horrendous shooting conditions, in this 28m:04s treat. This supplement saved the entire rating, truthfully. I wish I could say that this release lives up to my expectations of it, but I can't. I know others feel differently. Even after reviewing this, all I can say is that I would STILL not hesitate to buy this, but be prepared for a let down if making comparisons to more recent eye (and even ear) candy from Fox, New Line or Criterion.